Welcome to this week’s Favorite Food Friday where we share our favorite foods with our friends. I think everyone knows how much I love Le Cellier, so it was my pick for my Birthday trip this past week. My wife and son got the filet but I opted for the New York Strip and it’s melt in your mouth amazingness didn’t disappoint. 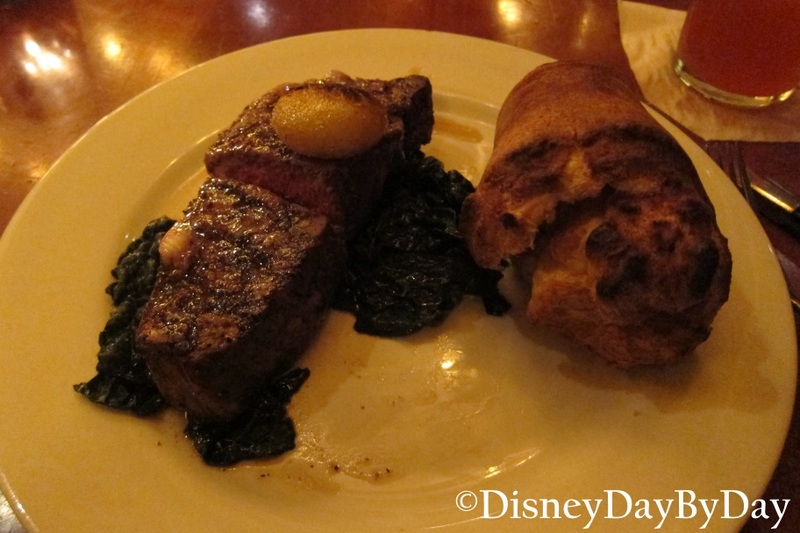 The steak now comes with a herb popover which I have never been a fan of, but that didn’t matter as I focused on the pretzel bread and steak. Get the InLinkz code right here to add to your post. Is the filet still as good as it used to be? I hear people complaining about Le Cellier all the time and it makes me sad. What exactly is an “herb popover”? Seems like it should come with some sort of potato to me. My girls got this last time and I think it came with mashed potatoes. My wife and son enjoyed the filet, they did have a bit more seasoning than we like, so next time we will ask for less seasoning. The herb popover is similar to a roll, but I was all breaded out by the bread I ate before the meal so I didn’t eat much of it.